For this post, we’re going to look at some of the upcoming features to improve the DMPTool as a collaborative tool. Administrators will be able to match the tool to the structure of their institution. For example, the main institutional administrator can designate editors and institutional reviewers to help researchers create excellent data management plans. DMP Creators can select co-owners to edit the plan. Grant writing does not happen in a vacuum. While one person may be responsible for the creation of the document itself, there are stakeholders within and outside of the project that will want to contribute to the creation of the data management plan. 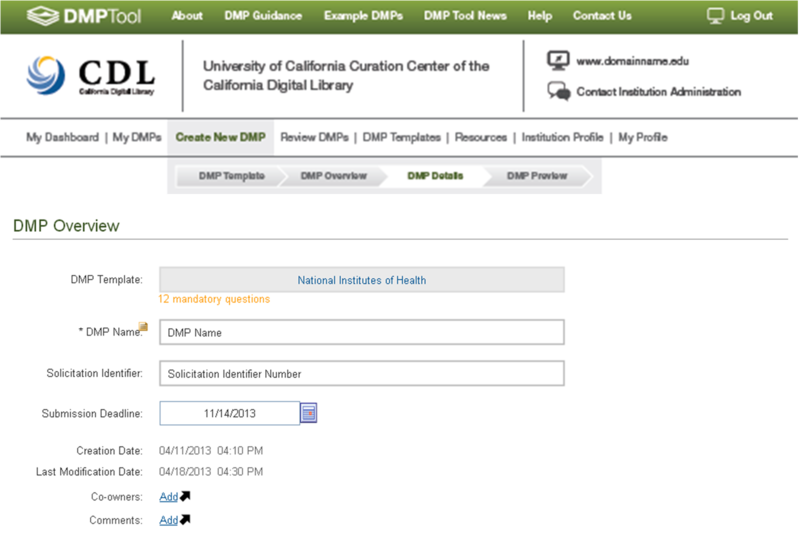 To make the DMPTool easier to use in this regard, we’re adding a co-ownership functionality. Plan creators can designate specific users and grant them the ability to edit and provide feedback on their data management plan. Plan owners can keep their plans private, share with their institution, or make it visible to all. One of the greatest teaching tools for data management planning is example DMPs. By structuring the administrative roles and plan co-owners in this way, the DMPTool is going to become an environment where users have control over who can see their data management plans. Plan owners can elect to make their data management plans visible publicly, within their institution, or only to the plan co-owners. Over time, each institution will be able to collect a series of plans to educate researchers and graduate students across their institution.